Suggest that your little guy pair a Gucci little boys boys long sleeves bomber jakcet with red shorts for a comfy outfit. 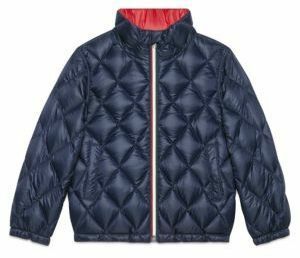 Suggest that your munchkin team a Gucci little boys boys long sleeves bomber jakcet from Saks Fifth Avenue with grey shorts for a fun day out at the playground. As for footwear your little guy will love navy and white sandals for this ensemble. Suggest that your little guy pair a Gucci little boys boys long sleeves bomber jakcet with brown jeans for a fun day out at the playground. This style is complemented wonderfully with dark brown boots. Suggest that your child dress in a navy bomber jacket and grey jeans for a laid-back yet fashion-forward outfit. As far as footwear is concerned, let your tot grab a pair of grey sneakers. 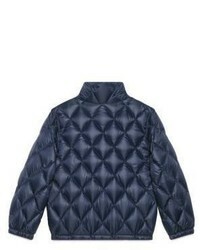 Reach for a Gucci little boys boys long sleeves bomber jakcet and light blue sweatpants for your son for a comfy outfit. Blue sneakers are a great choice to complement this ensemble.